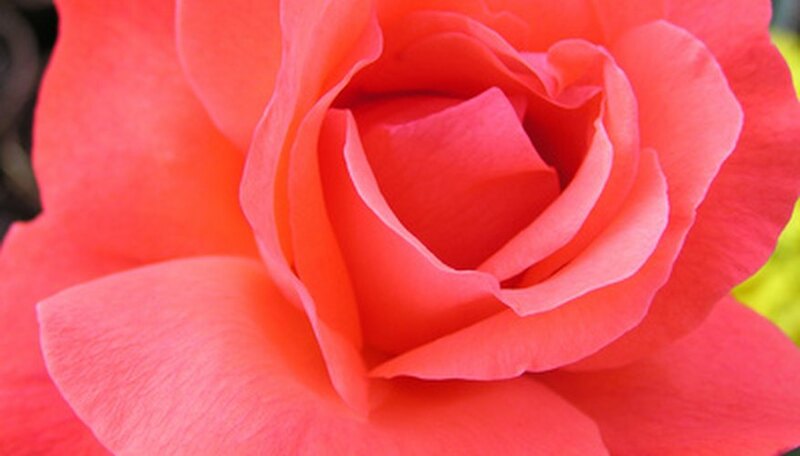 With 35 different categories or types of roses, enthusiasts will find a wide variety of flowers from which to choose. Many modern roses are the result of intentional hybrid breeding or are naturally occurring hybrids. These include hundreds, or more, of sub-types in many different colors and scents. The particularly fragrant flowers range from heirloom scented to miniature roses. The American Rose Society's top 10 picks for most fragrant roses include a comprehensive list of some of the best-smelling buds. The list includes Aida Medium Red, Captain Harry Stebbings Deep Pink, Folklore Orange Blend, Dublin Medium Red, Fragrant Cloud Orange Red, Mr. Lincoln Dark Red, Limelight Light Yellow, Miss All-American Beauty Deep Pink, Tiffany Pink Blend and Royal Highness Light Pink. Known as Nuage Perfume or Duftwolke, the Fragrant Cloud Orange Red variety was a top pick by the American Rose Society as one of the most fragrant flowers. Falling under the class Hybrid Tea Rose these citrus-scented roses grow best in USDA Plant Hardiness Zones 4 through 9. Fragrance awards include the American Rose Society's Gamble Award for best scent, growth, blooms, disease resistance and popularity. The Hybrid Tea variety populates much of the Gamble Fragrance Award list. Notable varieties include the Crimson Glory, which was the first rose to win the Gamble Fragrance Award in 1961. With dark red blooms, this flower has a fragrant damask scent. Since its inception in 1935, the Crimson Glory has spawned more than 5,500 descendants. These include many fragrant varieties and Gamble notables such as the 2004 award winner Mr. Lincoln, Oklahoma, the 1974 award winner Papa Meilland and the 1965 award winner Chrysler Imperial. Other award-winning Hybrid Tea's include Sutter's Gold, Granada and Double Delight. With a bounty of abundant blooms, the Floribunda rose is also known as a highly scented flower. Winning awards such as the Gamble and others, these hybrids have a strong, often lemon-like, fragrance. For example, the Floribunda variety Angel Face is a lavender rose with what can be termed as an "old fashioned" strong fragrance. A Gamble Award winner in 2002, this highly disease-resistant plant was first bred in 1968 and has received multiple awards in addition to the Gamble including the American Rose Society's John Cook medal. Other fragrant Floribundas include the Sunsprite and Fragrant Apricot. What Flowers Bloom in February?